I always see scones available at coffee shops and random bakeries. And I have to admit that sometimes I like them (raspberry and cranberry being my favorite), but other times I think they just taste hard and dry. 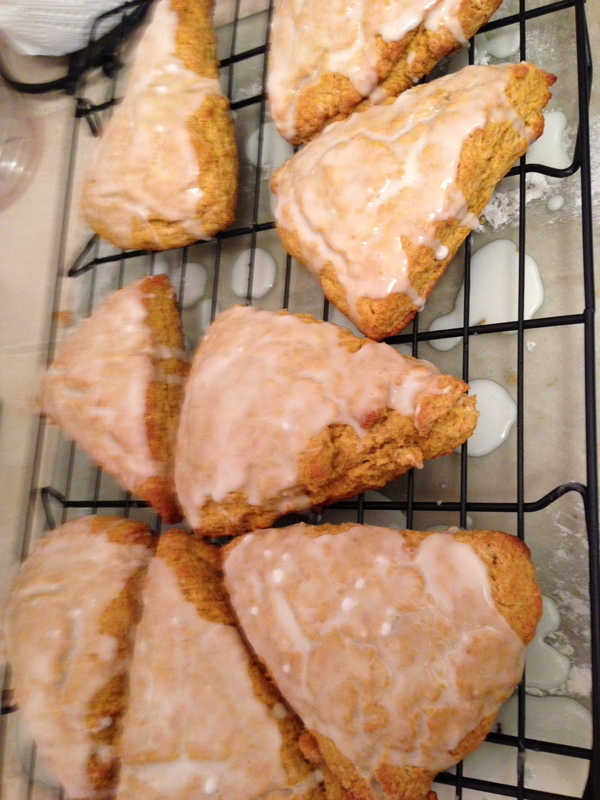 With October coming around, I figured it was only right to make pumpkin scones and I was pleasantly surprised. They are soft and moist. Suddenly, I think I’ve been eating bad scones my whole life! And my world is just opening up. Now I have to start making all different types of scones to experiment! 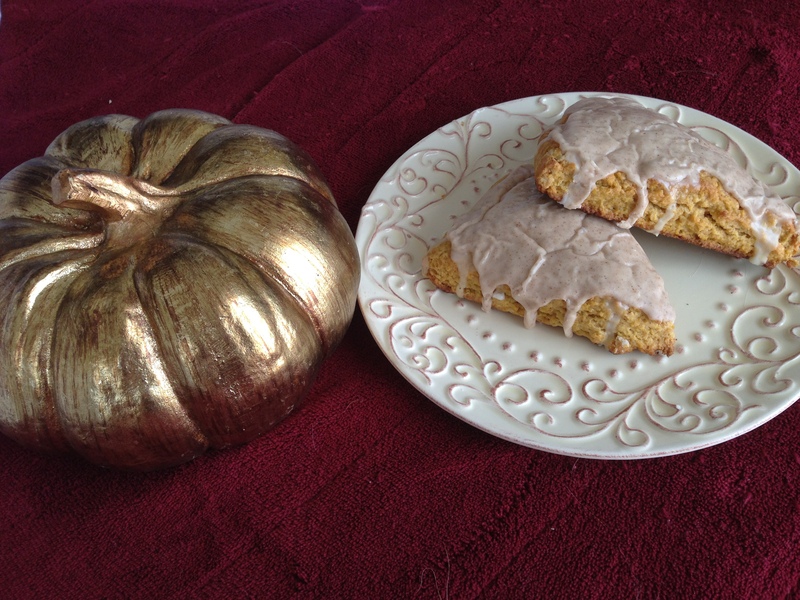 Try this lovely pumpkin recipe. ** if you don’t have pumpkin pie spice use ½ teaspoon of cinnamon, ½ teaspoon of nutmeg and ¼ teaspoon of ginger. (1) Preheat your oven to 425 degrees and line a baking sheet with parchment paper. (2) In a large food processor (or in a large bowl) combine the flour, sugar, baking powder, salt, cinnamon, nutmeg, cloves, and ginger. Pulse or whisk to combine. Add the cold cubes of butter and pulse until well incorporated. 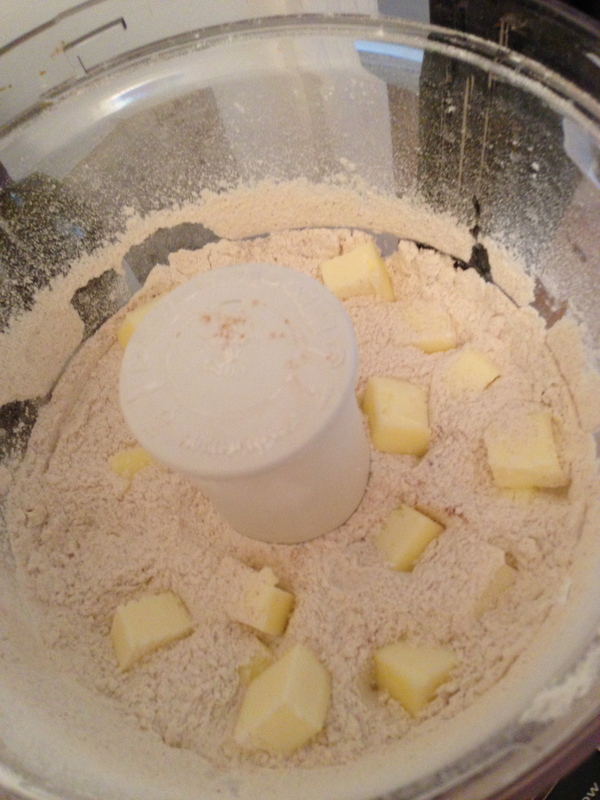 If you don’t have a food processor, mix in using a pastry blender. In a separate bowl, whisk together the pumpkin, half & half, and egg. Add the pumpkin mixture to the flour mixture and pulse until just combined (or stir until it forms into a ball). (3) Place the dough onto a lightly floured surface and gently knead a few times to bring the dough together. Take the kneaded dough and flatten into a circle 1″ thick. Using a knife cut the dough into quarters, and then each quarter into halfs, for a total of eight pieces. (4) Place the wedges onto the prepared baking sheet and bake for 14-16 minutes, or until just starting to turn golden brown. Remove to a cooling rack to cool completely (about 30 -45 minutes). When the scones have cooled, whisk together the plain glaze ingredients, and spoon on top, spreading slightly to cover the top of the scone. (It will still look transparent. Don’t worry the spiced glaze will make it look nicer!). Let the plain glaze harden for 10 minutes, then whisk together the spiced glaze ingredients and spread or drizzle on top. (5) Let harden completely (about 1 hour) before serving. You can store these for a few days in an air-tight container, but of course they are always best fresh!